Austrian dramatist and journalist; born in Vienna Jan. 28, 1845; died there Jan. 31, 1892. The Zappert family, many members of which have gained prominence as merchants, originally settled in Bohemia, and spread thence to Hungary and lower Austria. Bruno, who was the son of August Zappert, a manufacturer, received his early education at the gymnasium; and, though desiring a university training, he entered the Vienna commercial academy in 1862 with a view to fitting himself to continue the business of his father. The latter's untimely death, however, caused him to change his plans, and he engaged in the publishing business in Vienna, beginning with Wallishauser, and in 1869 assuming the sole management of Hügel's house, which he conducted till 1877. He then took up dramatic literature, becoming secretary and artistic director of the Presburg theater, and later dramatist of the Carltheater in Vienna, where he worked for two years under Director Steiner, and for three years under Tatarczy. 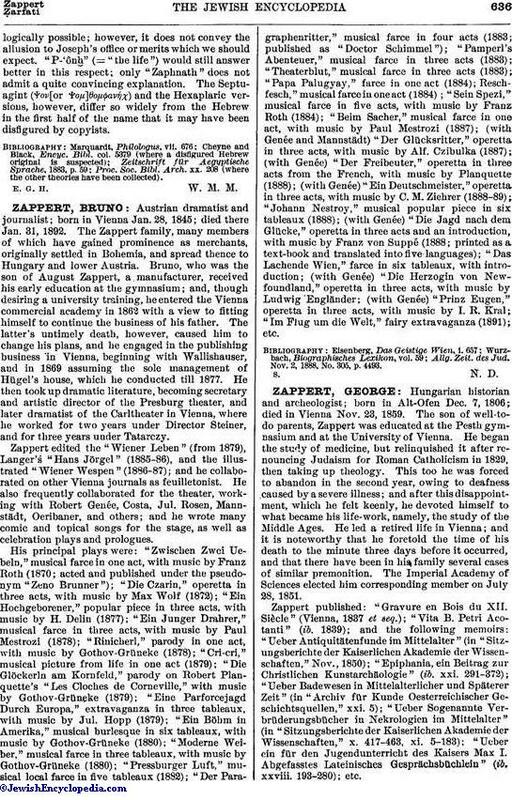 Zappert edited the "Wiener Leben" (from 1879), Langer'ṡ "Hans Jürgel" (1885-86), and the illustrated "Wiener Wespen (1886-87); and he collaborated on other Vienna journals as feuilletonist. He also frequently collaborated for the theater, working with Robert Genée, Costa, Jul. Rosen, Mannstädt, Oeribaner, and others; and he wrote many comic and topical songs for the stage, as well as celebration plays and prologues. His principal plays were: "Zwischen Zwei Uebeln," musical farce in one act, with music by Franz Roth (1870; acted and published under the pseudonym "Zeno Brunner"); "Die Czarin," operetta in three acts, with music by Max Wolf (1872); "Ein Hochgeborener," popular piece in three acts, with music by H. Delin (1877); "Ein Junger Drahrer," musical farce in three acts, with music by Paul Mestrozi (1878); "Rinicherl," parody in one act, with music by Gothov-Grüneke (1878); "Cri-cri," musical picture from life in one act (1879); "Die Glöckerln am Kornfeld," parody on Robert Planquette's "Les Cloches de Corneville," with music by Gothov-Grüneke (1879); "Eine Parforcejagd Durch Europa," extravaganza in three tableaux, with music by Jul. Hopp (1879); "Ein Böhm in Amerika," musical burlesque in six tableaux, with music by Gothov-Grüneke (1880); "Moderne Weiber," musical farce in three tableaux, with music by Gothov-Grüneke (1880); "Pressburger Luft," musical local farce in five tableaux (1882); "Der Paragraphenritter," musical farce in four acts (1883; published as "Doctor Schimmel"); "Pamperl's Abenteuer," musical farce in three acts (1883); "Theaterblut," musical farce in three acts (1883); "Papa Palugyay," farce in one act (1884); Reschfesch," musical farce in one act (1884); "Sein Spezi," musical farce in five acts, with music by Franz Roth (1884); "Beim Sacher," musical farce in one act, with music by Paul Mestrozi (1887); (with Genée and Mannstädt) "Der Glücksritter," operetta in three acts, with music by Alf. Czibulka (1887), (with Genée) "Der Freibeuter," operetta in three acts from the French, with music by Planquette (1888); (with Genée) "Ein Deutschmeister," operetta in three acts, with music by C. M. Ziehrer (1888-89); "Johann Nestroy," musical popular piece in six tableaux (1888); (with Genée) "Die Jagd nach dem Glücke," operetta in three acts and an introduction, with music by Franz von Suppé (1888; printed as a text-book and translated into five languages); "Das Lachende Wien," farce in six tableaux, with introduction; (with Genée) "Die Herzogin von New-foundland," operetta in three acts, with music by Ludwig Engländer; (with Genée) "Prinz Eugen," operetta in three acts, with music by I. R. Kral; "Im Flug u die Welt," fairy extravaganza (1891); etc. Allg. Zeit. des Jud. Nov. 2, 1888, No. 305, p. 4493.